Starting a Pizza Business? Curious to know what 3 key elements are required for success? What is the pizza niche that will almost guarantee you will thrive in the pizza and sub shop market? With nearly $38 billion in U. S. sales, the 66,000 plus pizza joints are popping up everywhere. Seems like anytime is a good time to start the pizza shop! When starting a pizza business the smart entrepreneur wants to know how to be successful…Period. She doesn’t want to read forty books, spend hours in the library studying and then spend the time to reinvent the wheel. It is much easier to pick the minds of people who have real live experiences in making and/or selling pizzas. So, I encourage you to make a small investment in yourself to be in the know before you jump into the business. Doing so, I suggest, will allow you to break in to your marketing area with a bang and claim market share from your competitors (who just thought they knew how starting a pizza business works). Bev Collins, a worldwide authority on how to make truly great pizza, offers sought after guidance in her 71-page ebook and a nearly 80 minute video about making home-baked pizza. Her acknowledged authority is entitled, Secrets from Inside the Pizzeria. Bringing her insight and your skills together is an unmatched combo! Imagine, home-style pizza in your pizza shop. Your initial marketing goal is to take customers from the competition and also attract new ones. You must decide if you’re going to compete on price with a low-end product or on quality with a high-end product. This is a major decision in starting your pizza business. You don’t. That’s what others do. What’s the right niche? It is to stake your claim as the best in town. The reality is that customer will pay more for really deluxe pizza. Besides, your margin (markup) is higher per sale. Now you have what your competitors do not. You’re in business and growing! Huge numbers of customers use the Web to find out which pizza and sub shop they’ll try, where it is located, the hours of operation, what distinguishes one restaurant from another and, of course, to place an order. 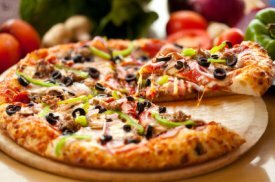 More and more customer will choose your pizza restaurant based upon the appealing content of your website. Your website is your window to make the case why your pizza is the finest and what makes you special. Don’t just build a website. Make it a “business” website; one that will get found on page one of the search engines. This is how you make money from day one! Thank you for visiting Starting a Pizza Business.